Manufacturer :Shincho Seiki Co Japan. 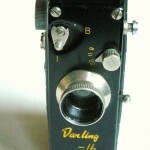 Vertically styled subminiature camera . 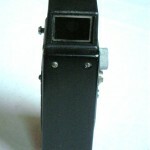 Made of black plastic with metal covering front and back. 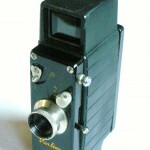 Makes 14 exposures of 10x12mm on 16mm un perforated film,on cartridge that is similar to the Mamiya cartridge . Lens : 35mm fixed f8,0, f11,f22 giving it an equivalent of 85mm lens in the full framed 35 format. Two speed shutter ,B and 1/50sec. 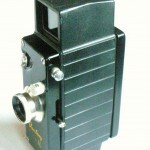 It was only available in a black bakelite body . 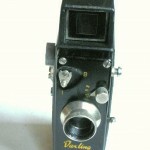 There are also variations in the dials on the side of the camera. It has no flash synchronization. 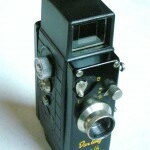 Its aperture is selected by a small knob above the lens, with three positions: 8, 11 and 22. Its lens rim is fixed and chrome finished. This version is known with yellow engravings. 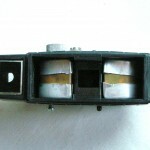 The second version has a pc synch socket,this version is known with red, orange or green engravings. The third version is only known so far with green engravings. And the last version is a name variant called Albert , inscribed Albert fifth avenue New York under the lens. and was made for promotional purpose . Dit bericht is geplaatst in D. Bookmark de permalink.